We didn’t have much choice over Chinese New Year this year. We’d given it a miss in 2017 but ‘letting down’ the family again was never on the cards. 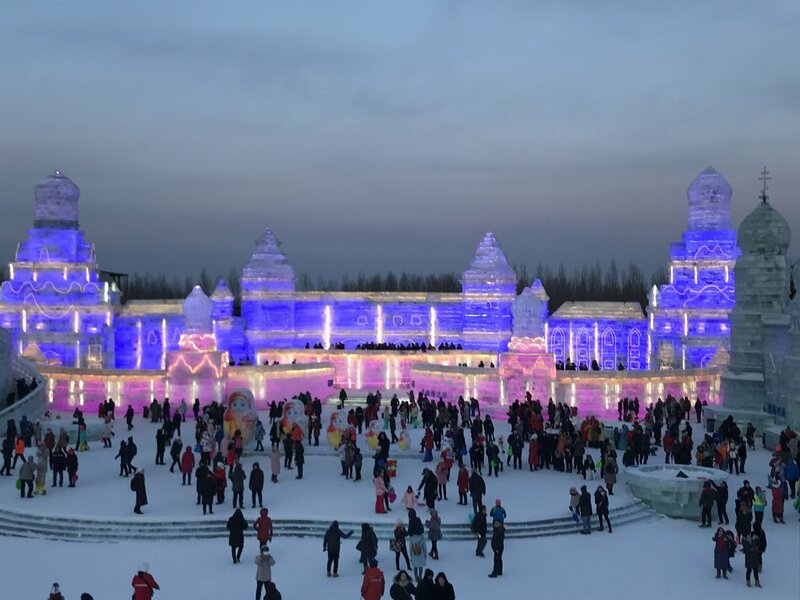 We duly packed our bags, temporarily closed our restaurant and caught our flights to my hometown – the ice city Harbin (currently around minus 25). We spent a week with all the family, and of course most of that revolved around food and dumplings. Lots of dumplings. They were rather astounded by my dumpling-making skills. But hey, practice makes perfect! Our trip did not stop at Harbin. We also took in Guangzhou and Nanjing at time of writing with Beijing and Kunming to follow. And talking of ‘took in’, we certainly did just that throughout the holiday. We ate a lot. Here are some of our adventures. In my memories, Harbin used to be even colder. And I remember vividly walking or sliding home from school was such good fun, as I would spend most of my pocket money buying ice cream on the street. Yes, ice cream in the minus 30C winter! And of course given the temperature, they are selling the ice cream straight out of a box. Who needs a fridge when it’s minus 30C! It might seem strange that we wolf down once cream in winter but we can do this because indoors it is always very warm. And that’s not just indoors. We mean inside the body too as every family’s favourite dish in winter is stew. 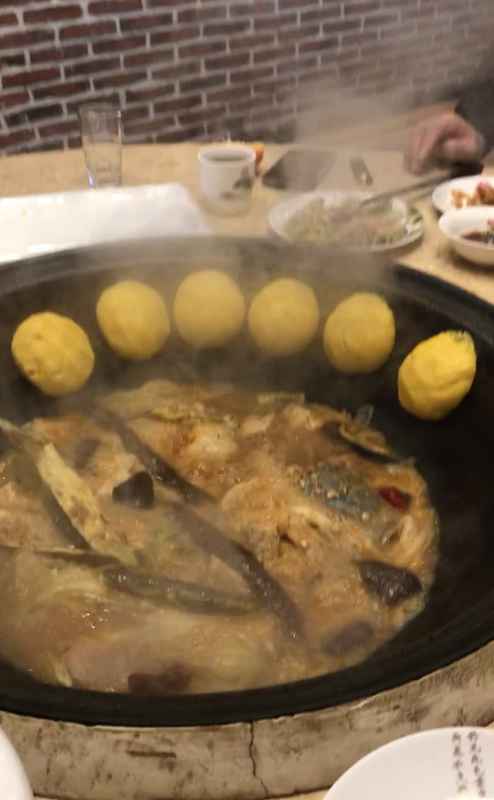 Fish stew, rib stew, chicken stew, pickle cabbage stew or even a random stew (乱炖 luan dun). This time, we went slightly outside the city to a country style restaurant, which takes this style of eating to an extreme. As soon as we walked into the room, we saw this massive pot in the middle surrounded by a heatable brick bed. This is the same style as in a country house. In the meantime, they started to put firewood under the big pot and we start to feel the heat spread beneath our collective bottoms. The fish stew was cooked in front of us, and after the fish was done they put in some cabbage, tofu and potatoes. The last step was the most interesting. They put the local corn flour dough at the side of the pot and put the lid on. The Chinese corn bread was cooked by the steam from the stew and also able to get crispy from the heat of the pot. Ingenious no? This is a very traditional northeast way of cooking, but growing up from the city, this was my first time to experience that. The fish stew was delicious and the pot continued to boil as we ate, ensuring the flavour got even better. It certainty warmed me up and the heated bed become a perfect place to rest my nearly busted tummy. There’s a saying in China ‘食在广州’ which means ‘Guangzhou is the place to eat’. Cantonese cuisine is famous for its diversity in terms of eating everything from rat to snake and all the strange parts of the animal but also its distinctive fresh tastes, where the concept is to enhance the food’s natural flavour by clever use of ingredients and light seasoning. There’s also a soup culture here, which the local people believe through slowly simmered Chinese herbs, meat and vegetables unique health benefits flow. Different combinations are used for different purposes, such as healing a cold or strengthening the body. I honestly don’t fully believe in the magic of soup, but I do like the taste, at least most of them. If you have to pick one type of food to represent Guangzhou, it will probably be dim sum. There’s literally dim sum everywhere, and you can see some retired people sit there from early morning to afternoon with a newspaper, a pot of tea and two or three dim sum. It seems a quite relaxed city, even if there are so many crazy post-modern buildings all around the city. The most memorable dim sum of our trip this time is called ‘毕德寥’ (bi de liao). Like most popular restaurants in Guangzhou, you have to queue to get in, but it was worth the nearly hour wait. We once again ordered a lot, from the famous must have shrimp dumplings, steamed red rice roll, shu mai and even some buns resembling potato. The reason why I enjoyed so much was because although dim sum is a traditional food, they seemed to give the food a colourful and playful look without damaging its distinctive taste. The shrimp dumplings came to the table in teacups in three colours and also a small teapot of chicken soup. The whole presentation was remarkably simple and elegant. We quickly finished our dumpling filled with sweet shrimps and washed the pleasure down with a cup of delicate soup. I have to say the two things combined made the whole experience extra special. The steamed red rice roll was also very special. This dish is not a traditional dim sum dish, but created by a famous chef- Guoxiong Chen, around 10 years ago. Right now, it seems to be turning into a new classic. It comes with a bright red thin steamed rice skin wrap around the fried shrimps and topped with sesame sauce. The bright red colour made it extremely tempting. With one bite, I was in heaven. I immediately understood why this is such a popular dish. Soft outside and crispy inside, the texture, the flavour, the whole combination was just wonderful. I suppose what we are eating today is very different from what it was like 200 years ago, and what we see as traditional today might be the new inventions in the past. This is what makes Chinese food so interesting, as it is always so innovative and involving. And in Guangzhou, the centre of Chinese foodies, I can feel its strong creative energy. What I learnt is that in order to keep people interested, a chef should never stop trying new things, being creative with ingredients and always staying true to the taste. Only this way we can keep the food alive and keep traditional recipe alive. And I hope my guests in Kewei’s Kitchen can feel our food is also alive. The food in China is always interesting, but this time I noticed the order system, and the payment systems in restaurant have also changed a lot. Every table has a QR code on it, in order to order dishes, the guests have to scan it and order from their smart phone. The kitchen will instantly receive the order and start to make your food. And once you finished your food, you can scan the QR code again to pay the bill through your smart phone, and of course, review or rate the restaurant all by few clicks. I was amazed by how efficient this whole system is, but does this means the restaurant will no longer need waiters or waitresses? I don’t know the answer, but once again I was amazed by China’s fast changes. However, I’m not sure these changes are all for the best, as I did feel like I have my food in a restaurant without much interaction with the waiters or waitresses, and that used to be one of the fun part of dining out. I also have noticed that quite a lot of people in the restaurant are reading on their phone while dining with their friends or families. As I myself become more and more addicted to my smart phone, I start to wonder if technology’s always on our side. At least, I know tasty food is certainly on my side. And for anyone coming to Kewei’s Kitchen, you will of course know exactly what we mean by tasty food! Once again, thank you for reading the blog and we will soon return to Denmark to put all these inspirations into our new dishes. Stay tuned for our new creations on Facebook and Instagram. And why not book a table on our reopen weekend March 18 & 19, which everyone will get a 10% OFF. Game on and see you soon!